Many of you know that Perry Noble is a fantastic leader, speaker, teacher, and writer. But did you know that he has already published a book? Perry wrote a book back in 2002 called "Blue Prints – How to build Godly Relationships", and it is AWESOME! Here is what is great about this book. NewSpring Church was born out of the material taught in this book! Back in 1998, Perry began leading a student Bible study at Anderson University to teach students how to build Godly relationships. This Bible study led to the launch of NewSpring Church. Blue Prints was written based on those Bible studies. Perry is passionate about this subject. If you have ever listened to Perry teach, you KNOW how passionate he is about developing Godly relationships. Easy, fast read. If you are like me, you want a book to be challenging, entertaining, and a fast read. Check. Check. Check. My family has been directly impacted by this book. I had a family member who was involved in a challenging relationship. For some reason, he picked up this book and read it in one sitting. It rocked his world. So, here is the deal. I found a couple of boxes of these books lying around here at NewSpring. They are very limited in number (I have located a couple hundred). If you want to pick up a copy, it is available via Amazon.com for $11.99 or via the Blue Prints website for $10.99 (free shippping). You can see Perry talking about the book back in 2002 (and a lot of other current NewSpring happenings) HERE. Today must be a day set aside to encourage the crusade! Cornerstone Church in Auburn, Alabama is teaching a finance series called Cha-Ching. As they prepared for the series, they decided to offer I Was Broke. Now I'm Not. as a resource for people. Jack Fisher contacted me and purchased a CASE of books. That is 81 books. Well, they are two weeks into the series and they are nearly out of books and are ordering more! The feedback they have been receiving from people who have read the book has been incredible. In fact, Jack sent me this comment this morning when ordering more books. "Another great Sunday with your book. The feedback is consistently excellent with everyone saying that it is something they can start on right away." When I wrote this book, my top priority was to make it PRACTICAL and ABLE TO BE APPLIED IMMEDIATELY. It is always good to get feedback that shows it happening! THEN, Jack sent me another e-mail today. It blew me away. 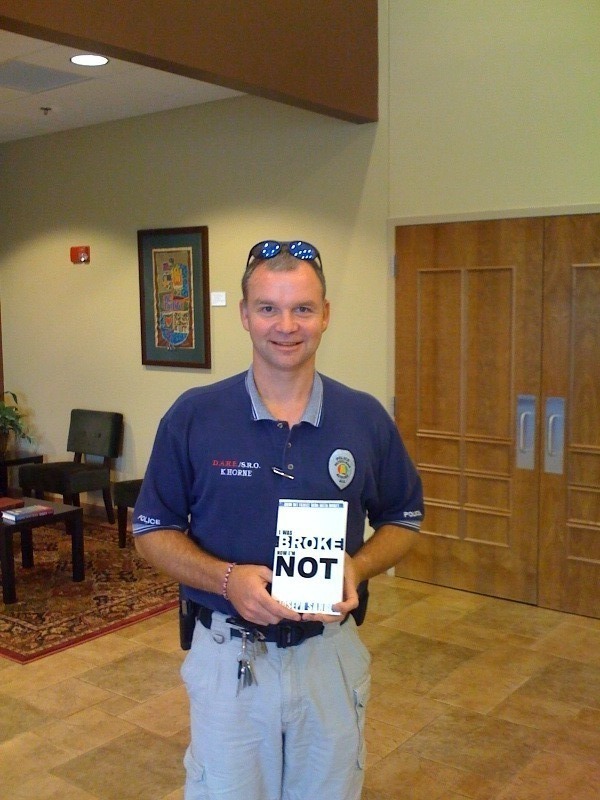 Right after I emailed you our local DARE Officer walked in talking about how he and his wife are fired up about how the book has changed them in just a few weeks. I attached his picture. That's what gets me going. Jack – I am so thankful for the kind words and feedback. Even more, I am FIRED UP to see that this crusade is helping people accomplish far more than they ever thought possible with their personal finances! When people have their finances in order, they are much more likely to go do EXACTLY what they have been put on this earth to do. And THAT FIRES ME UP! I love partnering with churches to help them teach strong financial principles. I L.O.V.E. IT! Have I said lately that I can't believe I get to do this for a living? John Bartlett had some really kind words about I Was Broke. Now I'm Not. I am so humbled by this type of feedback. I am a teacher through and through and any teacher will tell you that seeing others carry the message on to others is the ultimate compliment. Thanks, John, for the kind words. I am proud to announce that L.R. was the winner of the Personal Finance Art Contest! You can click on the artwork below to see a full-size version. L.R. identified Credit Cards, Overspending, and High Interest Debt as the cause of a first bankruptcy. 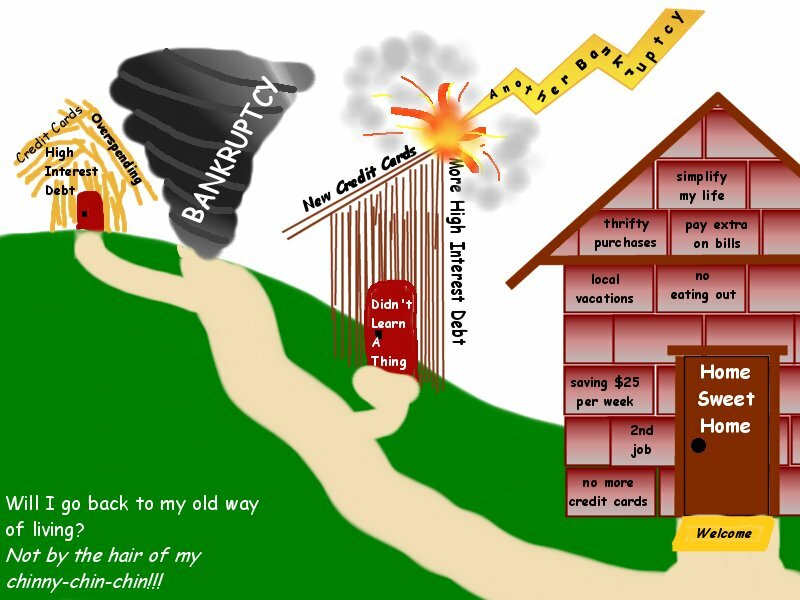 Then the credit cards came back (financial behavior was not changed) and another bankruptcy happened. L.R. then identified the causes of both bankruptcies and made lasting changes that will result in a bankruptcy-proof life. Thanks for the great artwork L.R.! Your prize pack consisting of a signed copy of I Was Broke. Now I'm Not, a Financial Freedom Experience T-Shirt, and of course this blog post is on its way!